*She’s the new millennium Bo Derek. 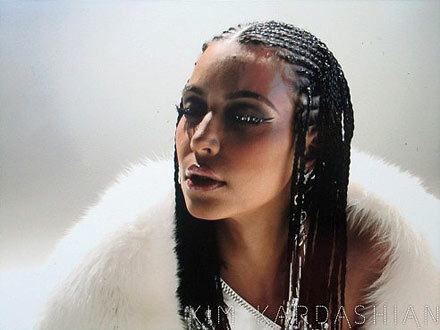 Kim Kardashian on Tuesday unveiled photos from the video shoot for her upcoming single, showing close-ups of her hair in cornrows. She went on to say that she tried several looks for the video, and will reveal more photos in the days ahead. Kardashian, who admits she’s “a little nervous” about its premiere, teamed up with songwriter and producer The-Dream in November to start working on “some fun music.” That session will be seen on the next episode of E!’s “Kourtney & Kim Take New York,” Sundays at 10 p.m.
Isn’t this a rerun? Didn’t y’all run an article about her in cornrows right before the New Year? Is she really THAT newsworthy? It’s becoming utterly ridiculous the number of articles ‘promoting’ this woman on Eur. Guess they haven’t received the memo…she’s not dating a black dude and even posted a photo of what she wants her future children to look like…not Black! Ahiiiight lady! You got the “as-s”?, but let’s NOT try to take it further than…”that”! Ladies & Gentlemen!! !, I present exibit “A” in what NOT!!!! to do, if you’re name is….KIm K. Haaaallah! WHY???? keep giving this TALENTLESS TWIT!! that’s right I said TALENTLESS!!! LOL!! any more attention than she deserves. She is laughing all the way to the bank. She looks pretty good if I were to be asked. Corn-rows a hair style, but not a life style.